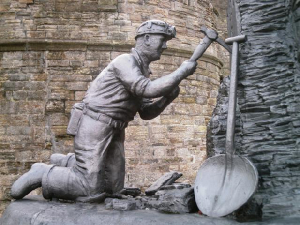 Whitehaven was a town built on coal, the industry that the monks at nearby St Bees first developed in the 13th century, although the town itself was planned and built in the 18th century. The town centre now is predominantly Georgian, although there is evidence of Italianate and Gothic architecture to be seen. It was the seat of the Lowther family, whose family crest was incorporated into the town insignia and which the Choir proudly wear as their blazer badge. The town is built on the foursquare grid system typical of Georgian towns. The town has ‘tons’ of history, not all of it good. 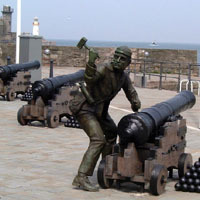 There are links with America, through George Washington (whose grandmother Mildred Gale is buried in Whitehaven) and John Paul Jones who was raised in the town, trained as a seaman and subsequently founded the American Navy, in a cruel twist of fate, he actually sailed his American ship ‘Ranger’ to Whitehaven in 1778 and attacked the town. There are also links with the slave trade, tobacco, sugar and rum. The wonderful coastline was once home to smugglers! There is a history of shipbuilding, plus ancillary trades and the town was once the third largest port in mainland Britain after London and Liverpool. More recently, the biennial International Maritime Festival has put Whitehaven firmly on the tourist map, attracting large numbers of visitors to the town and the creatively restored harbour. Add to this the fact that at only half-an-hour away from the Western Lake District it can be truly thought of as a gateway to the past, present and future. Whitehaven boasts a rich history of the Male Voice Choir movement. 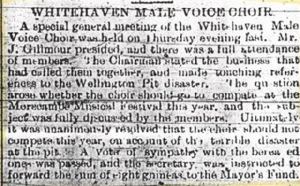 Printed in The Whitehaven Gazette on Thursday 6th May 1897 and recreated below is the first written record that exists as far as I am aware, about a Male Voice Choir in Whitehaven. On September 16th 1897 the following Public Notice appeared in the Whitehaven News, inviting gentlemen with fair voices to join the Choir. The above Public Notice invited songsters for a re-union, as the name B E Dadley appears in the May article and on the notice from September 30th below, It is believed the Choir were being invited to return following their Summer break. The following week’s Public Notice appears below. ‘Choir gave it’s second concert on Friday night (18th January 1907). Whitehaven had never had a Male Voice Choir in the memory of man. For a while there was an attempt to have one under an enthusiastic tonic sol-faist, but it died in its infancy. Now under the conductorship of Mr H R Woledge and an able committee with a choir of 40, it is established’. As the article mentions an earlier ‘attempt to have one under an enthusiastic tonic sol-faist’ it is believed the 1897 Choir must have disbanded sometime between 1897 and 1907. This appears strange as the person writing the 1897 article appeared very enthusiastic about the Choir. Maybe the tonic sol-fa method of teaching music was not appreciated. We will probably never know! On May 26th 1910 a special general meeting of the Choir was called. There was a full attendance of members! The meeting discussed the prospect of competing at Morecambe Music Festival in light of the recent local Wellington Pit disaster in which 136 brave miners lost their lives. Unanimously it was resolved that the Choir should not compete this year, on account of the terrible disaster at the pit. A vote of sympathy with the bereaved was passed and the secretary was instructed to forward the sum of eight guineas to the Mayor’s Fund. The following concert review appeared in The Whitehaven News June 4th, the review is of a charity concert for the Mayor’s Relief Fund featuring the Whitehaven Colliery Male Voice Choir. It is interesting to note that the article above refers to the Whitehaven Colliery Male Voice Choir. It is believed that this was a different Choir from the Whitehaven Male Voice Choir of earlier articles. All documents from 1923 onwards in our Choir’s possession refer only to the Whitehaven Miners’ Male Voice Choir and Whitehaven Colliery Male Voice Choir, (thought to be one and the same Choir). 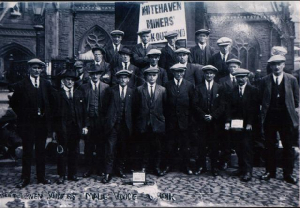 On June 12th 1923, twenty-nine members of the Whitehaven Miners’ Male Voice Choir began a tour of Cumberland, Northumberland and Durham in support of the ‘locked-out’ miners. They toured mostly on foot, returning to Whitehaven on 8th August. From the extensive, contemporaneous report written by a James Michael Holliday, who was appointed official historian for the tour, it seems the men sang for their suppers and relied on local support for lodgings at night. All this to raise funds for miners and their families. Two members of the Choir went on to become Mayors of Whitehaven, Mr Thompson Reed (1929-1931) and Mr William Stephenson (1933-1935) and as if we needed a link from the past to the present, the secretary of the Miners’ Choir Mr Joe Dryden, was the great-grandfather of our present choir secretary, Mr Don Messenger. Also, Mr Thompson Reed was the great-grandfather of our local MP for Copeland Mr Jamie Reed. On November 29th 1923 a concert was given by the Choir In aid of Whitehaven Infirmary Bazaar Fund (Harbour Ward) at the Empire Theatre, when there was an excellent attendance. The entertainment consisted of vocal items by the Choir, assisted by well known local artistes. The fine renderings given by the Choir were well appreciated, conducted by Councillor Thompson Reed. The outstanding singer of the evening was Miss L McCusker of Cleator Moor. Interestingly, on that occasion the Choir sang ‘Comrades In Arms’, which our present Choir also sing. 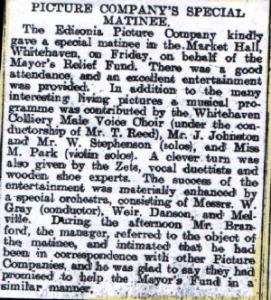 Reports of the concert appeared in both the Whitehaven News on November 29th and the West Cumberland Times on December 23rd. On March 20th 1924 the following article appeared in the local press. The special preacher was Mr Rowe of Whitehaven. In the afternoon a sacred concert was given by the Whitehaven Miners’ Male Voice Choir. 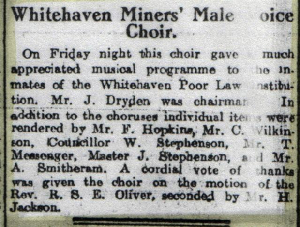 Sadly, the following article from March 20th 1924 when a concert was given to the inmates of the Whitehaven Poor Law Institute, is the last evidence our present Choir historian has of the Whitehaven Miners’ Male Voice Choir. Mr Joe Dryden was by then the Choir Chairman. In the future our historian plans to research Whitehaven’s Male Voice history even further. a fine man was he. a hewer of the coal. It’s a shame me little lad, your Dad you’ll never know. your Dad went off to Wellington, as he did most every day. the noise it grew and grew. I’d not done me hair. the pain that comes with fear. those stricken lads to save. But 136 miners lay in that cold black grave. all, they were struck down. A Workington church choir singing at Whitehaven’s Twenty-Seventh Musical Festival in May 1977 was listened to with deep appreciation by a member of the Festival committee. This member was Ronald Corless, and the choir’s performance left a deep impression on him. So much so, that later in the evening, he remarked to Baxter Shaw, a very well known local musician and singer that a choir of similar quality was needed at Whitehaven, to participate in festivals, and such like events. Mr Shaw agreed, and both remarked that whilst a mixed choir would be a fine thing, a male voice choir would evoke something really exciting in the way of musical sound. Mr Shaw was willing to be a Musical Director of a male voice choir, if Mr Corless could enlist local singers to form it. At the festival the next evening, Mr Corless contacted several singers, who were enthusiastic about the new venture and willingly promised their support. During the week Ronald got in touch with more enthusiasts, until the number who had pledged support, was well into double figures. He also contacted Gillian Kerrush of ‘The News’ and in the following weeks paper an article appeared, dealing with the proposed formation of a male voice choir. 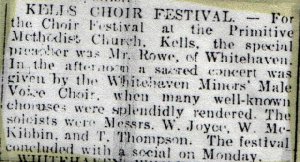 The article refered to the conversation between Mr Shaw and Mr Corless and how from this talk, the idea of the choir came about.From this a new Whitehaven Male Voice Choir was born, and the rest as they say, is history……………..